Advanced manufacturing offers rewarding career paths that provides opportunities to work with others and create change in the world. To do so, you need to develop both technical and interpersonal skills. Wondering how you can do that? Learn more from Emily and Bailey. 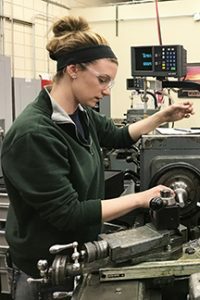 My name is Bailey, and I am just finishing my first semester in the Machine Tool Technology program at Ridgewater College. I worked on a farm for some time and saw how they made things to keep their farming operation running. In addition, I worked as a janitor in a cabinet making shop and saw CNC routers at work. I like the hands-on environment and would like to run the CNCs. How did you make the decision to pursue your education and career in manufacturing? I knew people that were CNC machinists, and I liked the idea of doing what they described because I really enjoy hands-on work. My brother-in-law is a CNC machinist. He was telling my husband what a great career it is, and they helped me to decide to try it. What do you enjoy about working in manufacturing? I like having to be precise in hitting the numbers and making functional parts from raw materials. It gives me a sense of accomplishment. What makes you happy and energized? I love learning new things and accomplishing tasks, and I get to do that all of the time in the shop. The second semester students have been very helpful in giving me good advice to complete my projects and perform machining operations correctly. 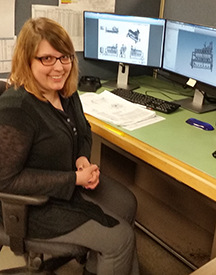 My name is Emily, and I am a Designer-Drafter at DCI in St. Cloud. What hobbies or school activities sparked your interest? I was on the FIRST Robotics team in high school, and I liked it very much. I also liked my Inventor class in high school, and I worked in the garage with my dad (he was a truck driver). I talked with my mom and dad, and I searched for Inventor classes. I found St. Cloud Technical & Community College’s Mechanical Design program. I came to an informational session, talked with one of the faculty, and signed up for classes. I like the challenge, variety, and the friendly work environment. I also like working on the shop floor with other employees. I enjoy going to work each day; I have good co-workers and a close family environment at work. What advice would you give high school students? Not all are dirty jobs in manufacturing, in fact, there are wide variety of jobs. Take some Project Lead the Way classes. Also, know that you can study for two years to start your career, especially if you are unsure what an engineer does. I did not have to attend college for four years to find a career I like and make a living. What did you like about your educational program? I liked all the Parametric modeling classes and the hands-on experience in basic welding and machining classes. I also enjoyed using a router, lathe, and CNC plasma cutter as well as being a member of the American Design Drafting Association. All in all, it was a great two-year experience. Want to learn more about pursuing a career in modern manufacturing? Check out these resources! Watch videos, explore career pathways, and learn about advanced manufacturing in Minnesota. Help the Zorblaxians make phones, guitars, and more through the free Build It Better! game app. Explore careers in advanced manufacturing by seeing what a day is like in different fields, and take a quiz to find the right fit for you!